I went to a nice seminar on Dementia at the local Community College yesterday to get some disabilities continuing education hours. This prompted me to condense all my notes on this topic. Hope it helps! Dementia is a disease or condition of the brain that causes global progressive deterioration (1). Inquire about specific issues, food needs, etc. You may need more than one instructor with senior groups, especially if you have two groups of one doing groundwork and the other riding. Some of these may be shown by seniors without dementia, so I included them in the title too. 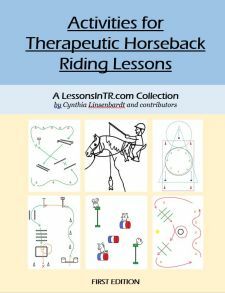 Use the horse – what would make him feel good? 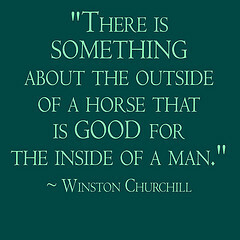 Explain reasons for how we do things in terms of helping the horse. It’s tempting to talk to the caregiver instead of the person themselves, but still talk to them and treat them with respect. Do not criticize, argue, correct – In the early stages it may be appropriate to remind them it’s a delusion, but as they progress don’t argue with them because often the delusion includes some truth that you can’t argue with. Often delusions indicate an emotion need, so address it then move on. (ex: she says she’s going home but home is in Kentucky. She’s expressing the desire to go home because she’s anxious. Engage that emotional need, “What’s at home?” then redirect when appropriate. White boards and info sheets to help them remember work IF they know to use it, usually if it’s something they already use. Exercise – The most helpful physical exercise to prevent/delay dementia is dance! Because it works hearing, balance, social, memory, mood (30 min 3x/wk showed decrease risk by 76%, including those with mobility issues doing chair dance) (1) – so include music and patterns in lessons! What have been your experiences working with clients with Dementia? Ivey, Carol (of Dream Catchers in Virginia). “Silver Saddles Serving Seniors.” PATH Intl Strides. Sumer 2016. Vol. 22, No. 3. Thompson, Dayna, M.S., LMHC. “Mental Health and Dementia: What a Clinician Should Know.” Presentation by IU Health at Ivy Tech University. 10/21/2016. Henning, Kim and Hommick, Tamara (of Cheff Therapeutic Riding center, Michigan). “Silver Saddles Program Targets Seniors.” NARHA’s STRIDES Fall 2010. Maraist, Jean (of Main Stay Therapeutic Riding). “Memory Centers: Day programs for seniors”. PATH Intl STRIDES. Summer 2011. Thank you once again for your wonderful and helpful information. Fantastic information! I just started working with my first rider with blindness and dementia. He was full of stories from his youth riding in Kentucky. Was the first time he spoke in full sentences in quite a long time. I saw the pics on facebook! That’s so wonderful!